Many New Zealanders will be aware of the debate around two proposals for windfarms in the Dunedin-Otago area, on the spectacularly beautiful, but ecologically fragile Lammermoor and Lammerlaw ranges – one by Trustpower in the Mahinerangi Area, and one by Meridian (Hayes Project) which proposes to take in a huge area of the Lammerlaws immediately south of the Old Dunstan Road and the Loganburn Dam. While wind power is seen to be an environmentally responsible energy source, the location, extreme scale, ecological and visual impact of these projects has drawn the opposition of a diverse range of groups, including farmers, conservationists and district planners, as well as high-profile advocates for the environment based in Central Otago, including All Black Anton Oliver, artists Marilynn Webb and Graeme Sydney, and poets Bryan Turner and Richard Reeve. While the press-releases of the power corporations promote the projects as having minimal impact, in reality some of New Zealand’s most iconic landscapes will be contaminated both visually and ecologically. Meridian wants to install up to 176 wind turbines with a generation capacity of 630MW – the world’s largest windfarm. The planned turbines are 160m high and the wind farm site covers 92sq km. To quantify the size of the Hayes Project wind turbines, they would each be as tall as a 70 floor skyscraper and would comfortably be able to fit a 747 jumbo passenger jet in their turbine blade circumference. The Trustpower Mahinerangi Windfarm will similarly impact in a major way on the landscape and on approximately 1000 ha of land of ecological significance in terms of its indigenous vegetation and/or biodiversity. The envelope includes important tussock grassland and wetland landscapes abutting, or close to, Te Papanui Conservation Park and some other conservation lands. It is a landscape of stark, austere beauty and silent simplicity, of lights and shadows and horizons. The power companies like it too. It is a long way from anyone else, which, says Meridian, reduces impacts on people and has the collateral benefit of attracting fewer objections. The huge installations are intended to supply the voracious energy appetites of Rio Tinto, Comalco and Auckland – the biggest consumers of power in New Zealand. As with the ‘Think Big’ hydroelectric schemes of the previous decades, once again Otago finds its landscape in the frame. The Upland Landscape Protection Society is not anti-electricity, but argues that turbines should be managed closer to consumption, be smaller and be placed in significantly modified landscapes, as per a recent report by the Parliamentary Commissioner for the Environment. Between the two proposals there are 326 towers proposed. 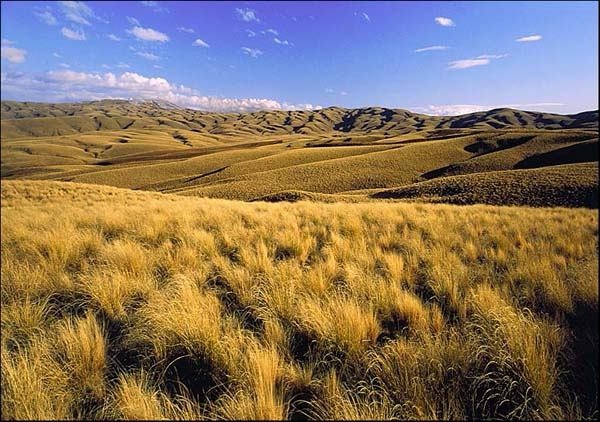 In construction these require twelve-metre wide roads – freeways for pest species – to be bulldozed through some of the last remaining mammelated tussock grassland in New Zealand. TrustPower’s industrial site is to be situated in Dunedin’s primary water catchment, with inevitable chemical run-off, largescale siltation of the local streams (800,000 cubic metres of spoil), and trauma inflicted on rare local species such as the New Zealand falcon and jewelled gecko. The impact of roading and tower construction and appearance on this rolling tussock landscape and its ecological systems will be major. Local vistas will never be the same again. At the time of writing, joint hearings for the wind farm project applications are in progress and will run through May 2007. Further proposals for wind farms in Otago wait in the wings. Meridian Energy is running what could be described as an underhand campaign, with attempts to bypass the hearing process and misrepresentation of the impact of the giant wind factories. It will be interesting to follow how the debate plays out, with both the energy corporations and applicants concerned for the impact on the Otago landscape arguing their cases on environmental grounds. The Lammerlaw Ranges – ‘not an outstanding natural landscape’ according to Meridian Energy.